Survivor: One World (2012) - 10th place, 9th out - 3rd juror. Voted out in Episode 9, "Go Out With A Bang" (Day 25). One World Ep. 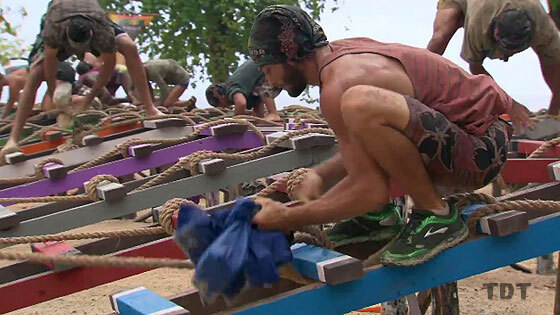 2 RC: "DIY Knots" - Manono wins again, sans Probst. One World Ep. 3 RC: "Shut Your Trap"- Loses to Alicia, as Manono is swept by Salani, 5-0. One World Ep. 3 IC: "Ow Pairs" - Sits out, as Manono loses again (after Salani copies Manono's puzzle). One World Ep. 4 RC: "Coco Connection" - Jay connects on one hit, but Manono loses. One World Ep. 4 IC: "Puzzle Relay" - Manono wins, but goes to tribal anyway. One World Ep. 5 RC: "Dear Liza" - Gets switched to Salani, and Salani wins. One World Ep. 5 IC: "Basket-brawl" - Salani wins against the old, slow, tiny new Manono once again. One World Ep. 6 RC: "Coco Pops" - Another Salani win. One World Ep. 7 RC: "Sea Turtles" - part of the winning team (with Troy, Alicia, Sabrina, Christina, Chelsea). One World Ep. 8 RC: "7UP" - Part of losing team this time (with Troyzan, Kat, Chelsea, Alicia). One World Ep. 9 RC: "DIY Ladder Tree Golf" - part of winning team (with Troyzan, Tarzan, Alicia, Kat). One World Ep. 7 IC: "Roller Ball" - Lasts until the third and final round (6th place out of 12). One World Ep. 8 IC: "Odd Shaped Bottoms" - In a surprise finish to the puzzle stage, Jay wins (1st/11). One World Ep. 9 IC: "When It Rains, It Pours" - quits for chicken wings and beer, leaving Leif vs. Chelsea (3rd/10). One World, Ep. 4: Bill Posley (voted out, 7-1). One World, Ep. 5: Jonas Otsuji (voted out, 10-2). One World, Ep. 9: 5 votes, from Kim, Sabrina, Christina, Alicia, and Tarzan (voted out, 5--2-1). One World, Ep. 14: Voted for Kim Spradlin (who won easily, 7-2-0). Just some bros. Doing bro things. 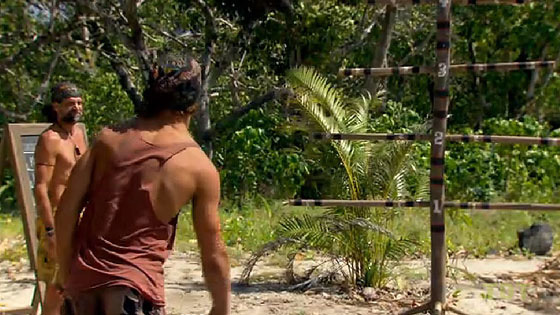 Gordon Holmes at XfinityTV.com (4/12/12): "Survivor: One World Castaway Interview – Jay Byars"
Rob Cesternino at RHAP (4/12/12): "Byars Remorse: An Interview with Survivor Jay"
Lindsey Silberman at TVGuide.com (4/12/12): "Survivor's Jay: I Never Thought in a Million Years I Would Step Down for Food"
"Jay says: Everybody wants to walk away with a million bucks, but that can be taken away from you in an instant. They [Survivor casting] saw an adrenaline junkie. They saw someone that's going to come out here and give it their all. Jeff says: He's going to prove to himself that he's enough of a workforce around camp. I don't think that many people would expect that, looking at him because he kind of plays that Southern good old boy. I think he knows exactly what time it is." "Personal Claim to Fame: Being a part of four different mission trips to four different countries. Inspiration in Life: Bear Grylls – that guy is crazy! And, I just found out he is a Christian. I love his "I can go anywhere and do anything mentality." Hobbies: Working out, indoor rock climbing and motocross. Pet Peeves: Smacking gum, bad breath and clingy texters. 3 Words to Describe You: Active, daring and charming. 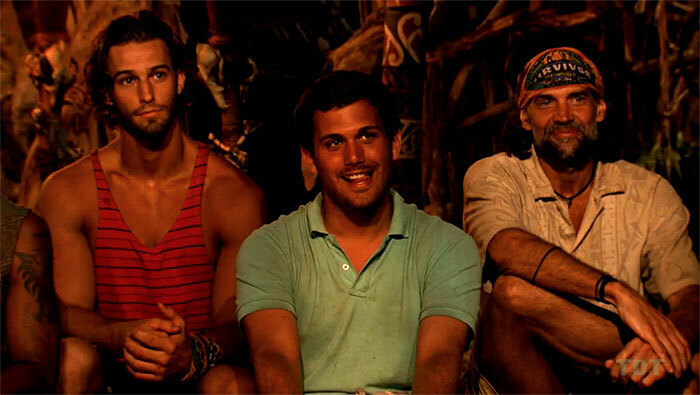 Survivor Contestant You Are Most Like: Colby or Rupert. They tried to play the game fair and honest, but they didn't have the physical ability to perform. I would choose their game play and my physicality. Reason for Being on Survivor: To experience life in an exciting and challenging way. I want to discover who I am and see if I can really outsmart everyone. Why You Think You'll "Survive" Survivor: I have heart. Plus, I'm very level headed. I'm going to be calm and consistent when people are breaking down. Why You Think You Will Be the Sole Survivor: I know that I have the will and the skill to make it to the end. I have overcome a lot in life, and who you are is how you play. I'm a winner."